Mission: Contributing to the promotion of citizenship for the residents of the Alemão complex of favelas and in other popular contexts; providing for social demands; stimulating autonomy and community participation; and developing methodologies that support public policy in the areas of education, health, employment, leisure, and human rights. Public Events: A range of educational opportunities for Alemão residents of all ages. Regular arts workshops, discussions, and community gatherings. How to Contribute: EDUCAP requests donations of food, school supplies, paper, spray paint, and other materials for use in its education and arts programming. It also welcomes collaboration with local and international social organizations. Contact EDUCAP staff through Facebook. 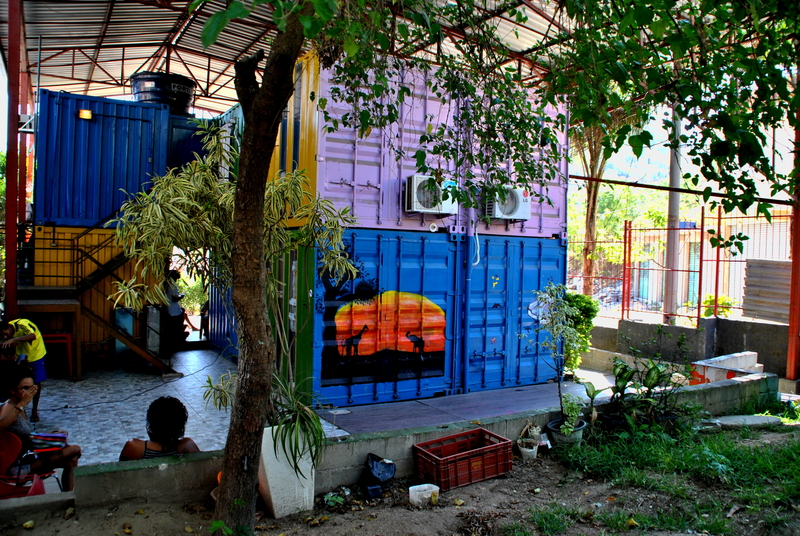 The Democratic Space of Union, Coexistence, Learning and Prevention, known as EDUCAP, is a community-based non-governmental organization (NGO) located in the North Zone‘s Complexo do Alemão. 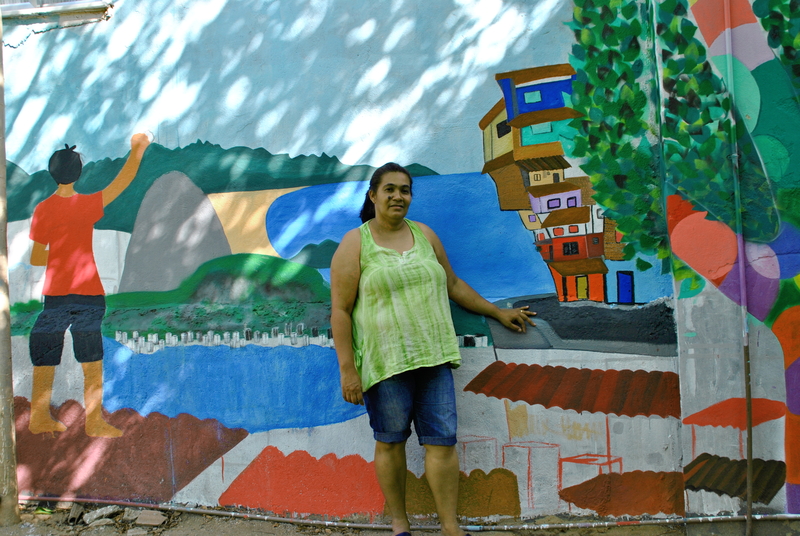 Alemão educator, organizer, and lifelong resident Lúcia Cabral founded the organization in 2008 to foster a variety of projects focusing on the health and education of favela residents. 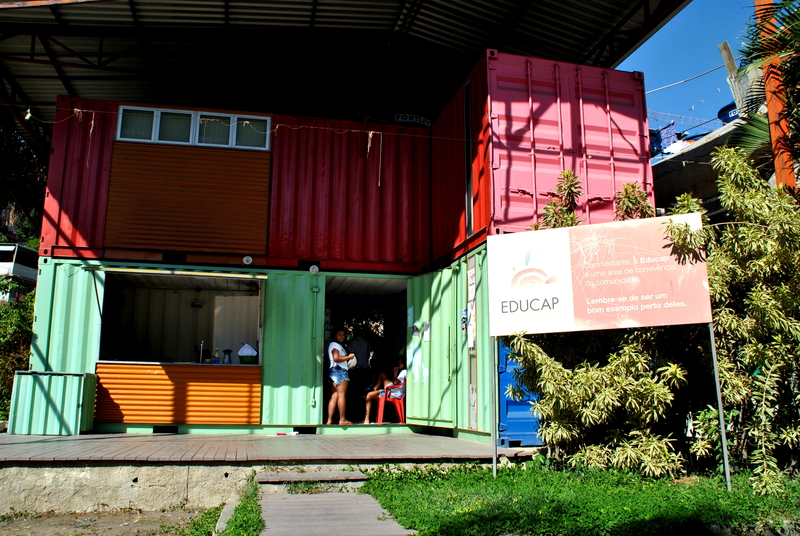 Nine years later, EDUCAP occupies a colorful headquarters made out of stacked shipping containers on Rua Canitar, built in partnership with the British Embassy and inaugurated by Prince Harry. Cabral has made EDUCAP a site of learning, community events, and productive partnership with other NGOs and community projects. Cabral got her start in education as a child. In 1967, when she was six months old, her family moved to Alemão from the state of Paraíba, following a wave of migration from Brazil’s rural northeast to industrial centers like Rio in the southeast. Much of the favela complex’s growth happened during the 1960s and 70s as families settled near their industrial employment. In 2012, it was made up of 15 communities with a combined population of 70,000 people, making it one of Rio’s largest favelas. Like most favelas, Alemão has been historically underserved and neglected by the city government. Violent police operations against drug traffickers and a tense relationship with the Pacifying Police Units (UPP) installed in 2012 often shutter schools and prevent residents from leaving their homes. Alemão also lacks quality educational institutions for its population. In 2014, 72% of public high school students were two or more years behind in their studies, and 22% dropped out altogether. Observing this reality, Cabral involved herself in many efforts to provide education to the communities of Alemão. She started using her house as a small school in 1986. At various points during the following years, she worked with the Industrial Social Service (SESI)’s literacy project, participated in projects run by the Center for the Promotion of Health (CEDAPS) relating to sexual and reproductive health, and managed a small school. Cabral also fought for Alemão residents’ human rights, working with Amnesty International to expose the violations that took place during the 2007 police operation that killed 19 people in the favela. Living in Alemão impacted Cabral. “This place made you take part in social movements: for basic sanitation, for the right to housing, for the right to education and health. I grew up in this environment, of the Residents’ Associations and the social movements of the favela. It turned into a package, a militancy. And I never stopped,” she says. She is one member of a vibrant civil society in Alemão that includes citizen journalists, social historians, and artists. In 2007, Cabral brought together a group of youth working on various public health projects and won a grant to found EDUCAP. When funding ran out, the organization left its original space in 2009. It was then able to occupy its current location in Campo do Sargento. There, a six-person team held classes in a wooden shack for large numbers of children. Thanks to the group’s tireless work, EDUCAP registered for NGO status in 2011, and Cabral’s proposal to the British Embassy program resulted in the construction of its current facility in 2012, with three classrooms, offices, a kitchen, and outdoor space. EDUCAP currently hosts several education programs. Three days a week, volunteers with the Community in Action NGO are at the center giving free English and computing lessons for groups of students of different ages. Rede Winner partners with EDUCAP to offer supplementary courses, which allow those who dropped out of secondary school a chance to get their diplomas through a battery of exams. Students pay a minimal fee for these classes, and a portion is returned to EDUCAP to cover classroom materials and facility expenses. EDUCAP uses its classroom space for other partnerships that teach specific skills. 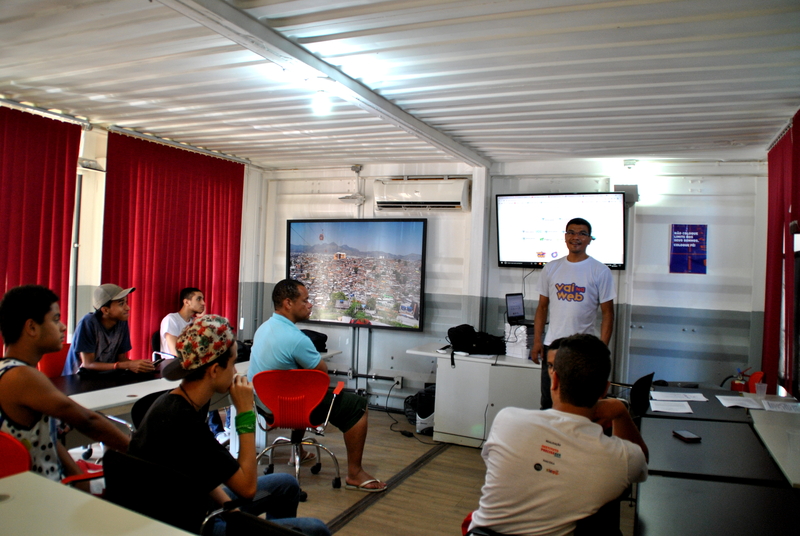 Vai Na Web (Go On the Web) offers free programming courses for Alemão youth with the aim of using digital technology as a democratizing force. 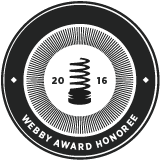 Graduates of the program can advance to higher levels and find employment in app design and coding fields. Cabral met the leaders of the initiative at a nonviolent communication workshop. She has built many of EDUCAP’s partnerships this way. “It’s not a mystery. I always participate in activities and meetings [around Rio]. Networks happen because I am in spaces where there are lots of people, where there are groups discussing the same topics, with the same objective. 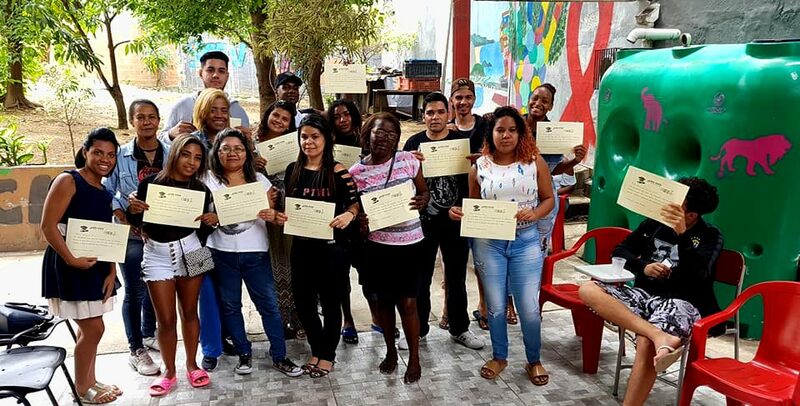 In the end, this network grows.” Given the time she has spent working in Alemão and the visibility that EDUCAP has achieved, the organization is able to fund itself through donations and partnerships, keeping much of its programming low-cost or free. The projects cited here only scratch the surface of Cabral’s engagement. EDUCAP partnered with international NGO Love.Fútbol to improve its soccer field and now hosts weekly practices for younger Alemão residents. Currently, it has secured a grant to bring local graffiti artists to the space and teach their art while working to paint a wall on the property. EDUCAP also serves as an incubator to fledgling community initiatives like Maternidade Consciente (Conscious Motherhood), a project started by social worker Camila Habdallah to promote natural childbirth and educate doulas, non-medical companions who assist a woman during the birthing process. In Brazil, 85% of all deliveries are by C-section, despite the World Health Organization’s recommendation that this number be at 15%. Habdallah’s partnership with EDUCAP aims to reduce obstetric violence by bringing together Alemão mothers through education. EDUCAP counts on a team of 20 people to run its regular operations, with Cabral acting as president. Among this group are interns, like Tamyres Alves, who studies social work at Veiga de Almeida University. 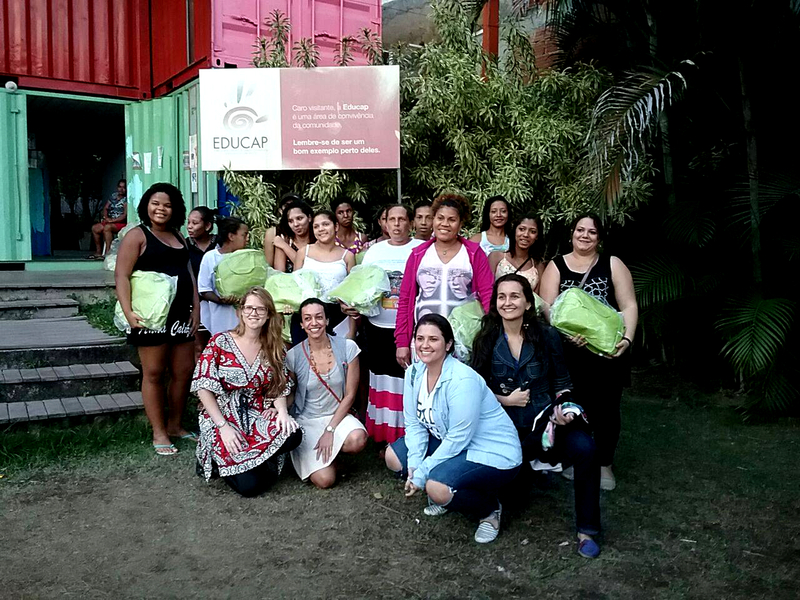 She explained that EDUCAP provides daily support to Alemão residents in various capacities. This includes printing and revising documents, providing connections to other social services, and facilitating their educational goals. “Here, [in] the conditions that Brazil is living today, the crisis, the unemployment, it is difficult [to find work even] with a diploma. Without, it’s even more difficult. And so people are here fighting to succeed,” said Alves. She understands sustainability as the ability to maintain the projects she has started. “To be sustainable, you have to have an equilibrium, you have to have a capital that will revolve around what you want to do,” she said. EDUCAP clearly values its human capital. It thrives as a space of combined force of will and reciprocity. During RioOnWatch‘s visit, its three classrooms were full of students, and EDUCAP staff never stopped attending to residents’ needs, distributing pens and even helping a family find the bus fare to take a sick relative to the hospital. “We end up managing to sustain ourselves with desire and will and love and hospitality. We have all the desire to continue receiving the people here,” said Cabral. She reflected: “When I started, I never imagined having a space like this one. I imagined everything, except having this space, except being able to attend to so many people.” For this reason, she knows EDUCAP will continue to achieve above and beyond her dreams, as a landmark success in favela service and education in Alemão and in Rio as a whole. 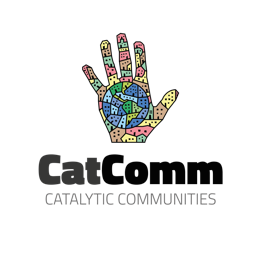 *EDUCAP is one of over 100 community projects mapped by Catalytic Communities (CatComm), the organization that publishes RioOnWatch, as part of our parallel ‘Sustainable Favela Network‘ program launched in 2017 to recognize, support, strengthen and expand on the sustainable qualities and community movements inherent to Rio de Janeiro’s favela communities. This article was written by Lucas Smolcic Larson, and published on November 21, 2017.